Articles for you and your business. At Macmillans Waller Fry, you can access our expertise in accounting, legal, and financial planning with the convenience of an intergrated service under one roof. We understand what it take to start and grow a business and turn finances into your dream retirement. When you don't have time to worry about the details of making it all happen, you need advisors who can offer you an all-encompassing service. Our accountants work closely with our financial planners. To find out how our accountants can work for you, download our brochure. Additionally, all our services are supported by our solicitors. When you need help with your day-to-day accounting and taxation, financial planning for your future, or legal services, we can help. Download our solicitors brochure, to see how we can help you. To book an appointment with our Maitland Accountants or Solicitors call (02) 4933 5355 or complete our contact form for a prompt reply. At Macmillans Waller Fry - Accountants Maitland we are experts in helping you legally minimise your tax. As tax agents we can help to minimise the penalties and can request leniency from the ATO on your behalf. We are adapt at covering many areas from a standard individual tax return through to more detailed returns including investment property or investments. We also have highly experienced accountants to help with complex tax issues, business taxation and challenging situations. Your time worrying about how to do a tax return again is over. For businesses please email us or call (02) 4933 5355 to arrange an appointment and discuss your business needs. 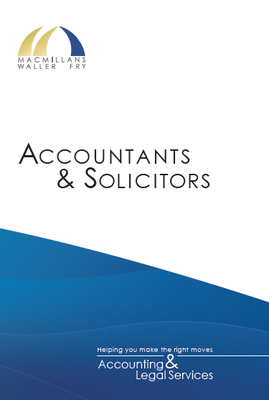 Click on the images to download our Accountants & Solicitors brochure or our Wills & Estate Planning brochure. Have you liked us on facebook or twitter yet? Click here for facebook or here for twitter, to get reminders for lodgement and payment dates as well as the most update-to-date business and superannuation articles by connecting with us.